All Dogs Go to Heaven was a popular movie when I was a kid. Well, Milton has discovered Heaven on earth, and it's called doggie daycare! 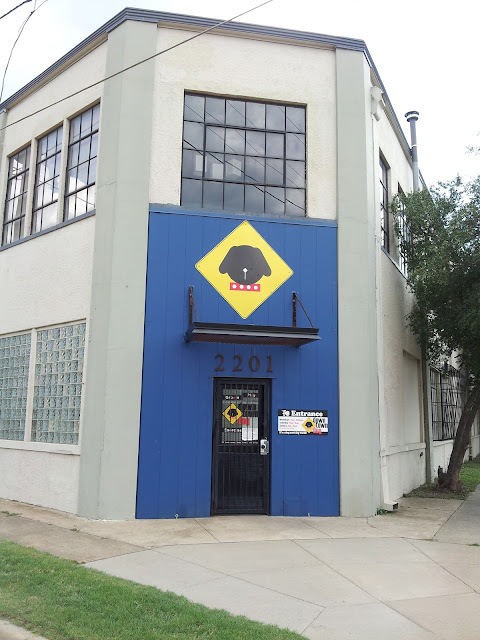 Three days per week Milton joyfully hops into Daddy's car, and together they carpool to Downtown Dog http://www.downtowndogdallas.com/. 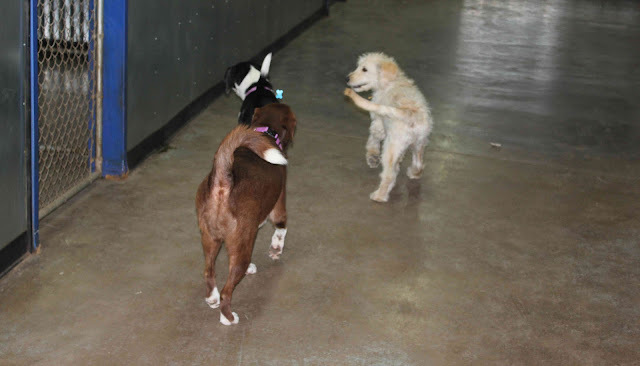 Before Milton entered our lives, I stopped by this daycare with a couple of close friends when they were dropping their two dogs off for the day. I was highly impressed by the facility, despite not having my own pup at the time. Downtown Dog is located in downtown Dallas which makes it very convenient for Jeff to drop the Milt off on his way to work and for me to pick him up after my work. The best part is the daycare is only $12 per day with long hours of 7:00A.M. - 6:30P.M which is especially convenient if either of us has a work conflict spring up. It is nice to be at work and not have to worry that our boy is home alone chewing on the dry wall, disassembling our bathtub drain, etc. I cannot even express how much our goldendoodle loves this place. 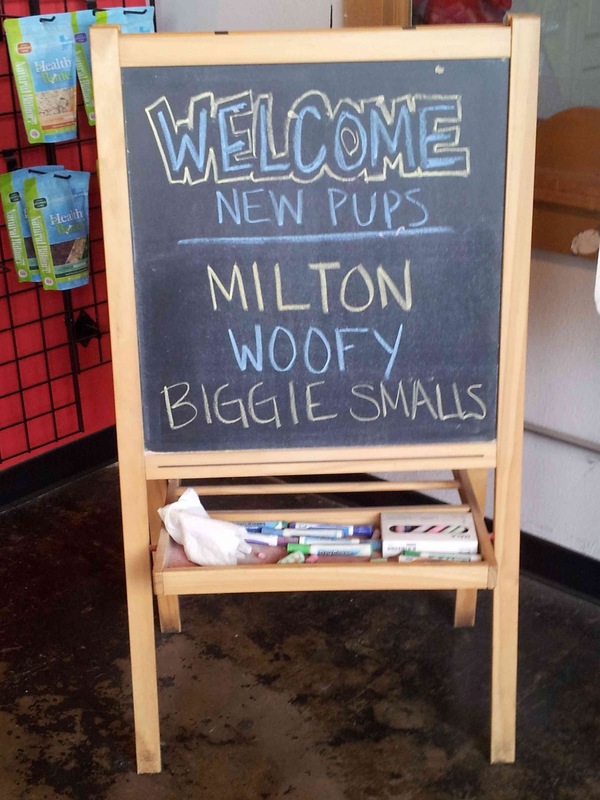 Milton's first day of daycare was spent with a celebrity - Biggie Smalls! Downtown Dog consists of multiple large indoor and outdoor play areas. The dogs generally spend the morning hours outside dashing through mazes, romping in kiddie pools, or channeling through tunnels. If you have a dog, like our Milt, all he wants to do is wrestle with his new buddies. The dogs even have a mandated nap time, complete with some human-style beds, from 12:00P.M. - 1:30P.M. when no visitors are allowed. Once about 3:00P.M. hits, the dogs are brought inside for the duration of the day to wait for their owners to begin arriving. 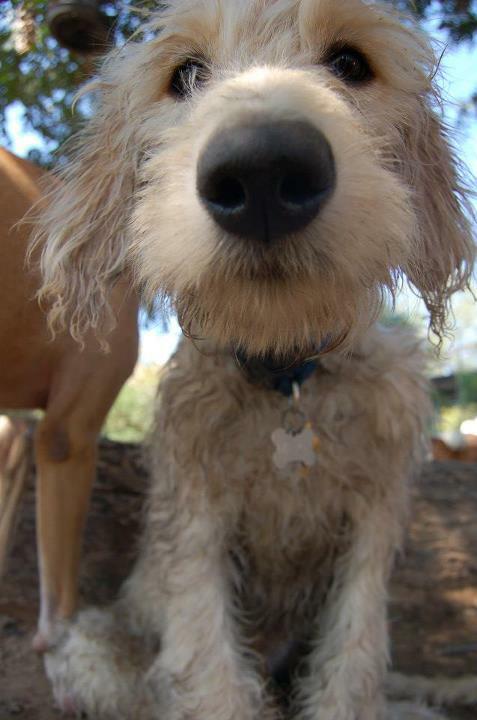 Our dirty dog delights in mud puddles, so he always requires a rinse and a brush, at no extra charge. When Milton first arrived, the staff eased him into the routine by placing him in an enclosed area of the play yard. Through a chain link fence, dogs could come up and say hello but not possibly harm or scare the Milt. Once he appeared comfortable, the workers would put in a few friendly, "feeler" dogs with the Milt to test the waters. Our goldendoodle jumped right in! Every morning when Milton leaves, I remind him, "Don't worry when all of your friends begin getting picked up this afternoon. Your Momma won't forget about you." Likewise, as the caring parents we are, we call daily, at about noon, to check on our little goldendoodle. The comment I always get is, "Your dog really likes to get dirty." It makes a mother proud. Downtown Dog can accommodate 100+ dogs per day, and it really warms my heart that so many people make the effort to drive their pup and pay in order to avoid a tedious day of monotony in the crate or gated off room. I know that dogs sleep a lot of the day, but after too many long hours, boredom can settle and mischievnous creep in. Since Milt is incredibly social, this daycare has been a huge hit with him. The best part is our goldendoodle puppy is ridiculously tired after a hard day of frolicking and rollicking, that he drops as soon as he hits the car and about three hours after we get home. This usually frees me up for an evening activity too, like yoga, if I want to take it. If you haven't tried it yet, I strongly suggest that you think about a doggie daycare for your guy or gal (google around and see what you find). Your pet doesn't need to attend every day of the workweek, but one or two days can really break up the home alone pattern and make for a happier doggie, and as we all know, "Our goal in life is to be as good of people as our dogs think we are." - author unknown.